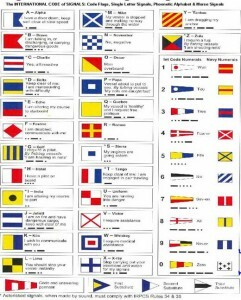 This short guide to flags, their usage and etiquette is written as an aid to members, who are encouraged to do their utmost to conform to the historic traditions associated with the subject; it will help them to avoid offending anyone by the inappropriate or incorrect use of flags on their boat. This guide is not definitive so, should you need further advice, please contact the Club. The flags that may be flown by yachts include: the National Maritime Ensign, The Club Burgee, The Club Flag Officers’ Flags, House Flags, Courtesy Flags when abroad and Flags connected to either signalling or racing. British Yachts fly the National Maritime Flag (The Red Ensign) as their Ensign unless their Club is privileged to wear a special Ensign. Our Club does not currently hold the privilege; we therefore use the Red Ensign. Ensigns should be flown in a prominent position, normally at a staff on the stern. They may be flown when under sail by Gaff Rigged Yachts at the peak of the sail on the after mast, by Yawls and Ketches at the mizzen masthead and by others at a position two thirds of the way up the leach of the aft sail. The Ensign should be worn when entering or leaving harbour and must be worn when entering or leaving a foreign port. It is normally worn in harbour when the crew are onboard but need not be worn at sea except when meeting another vessel or coming close to the land. Yachts that are racing do not wear Ensigns. In harbour, the Ensign should be hoisted at 0800 in Summer and at 0900 between 1 November and 14 February. It should be lowered at 2100 or sunset whichever is the earlier or when the crew go ashore if before that time. Ensigns should not be left flying overnight in harbour. The NWCC has its own burgee which all members are encouraged to use on their yachts. It signifies membership of the Club of which we should all be proud. Yachts should only fly one Club Burgee at a time irrespective of the number of Clubs for which they hold membership. Club Burgees should be flown from a staff at the masthead or alternatively, if this is not possible, from the starboard spreader in home waters and from the port spreader abroad. The Burgee should be flown at the same times as the Ensign in harbour although in recent years it has become common practice to leave the Burgee flying at night if the owner is either onboard or ashore in the vicinity. This practice is acceptable. At sea the burgee is normally flown in sight of land or other vessels. Members Club Burgees should be flown in any yacht chartered by them in preference to that of the charter company or owner. 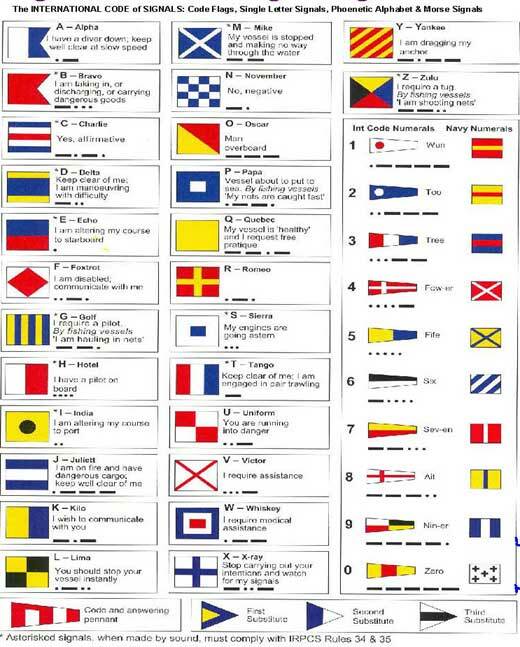 These flags are flown by day and night while the owner is either onboard or in effective control of the vessel. 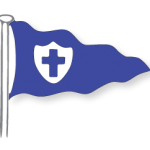 Flag Officers’ flags are rectangular, with a swallowtail fly (a guidon), and incorporates the club cross. They are flown in place of the burgee. 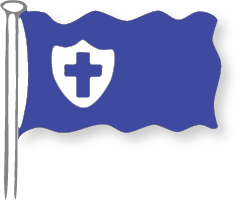 The Rear Commodore flag has two vertical balls in addition to the cross, the Vice Commodore flag has one ball, while the Commodore flag just has the cross. 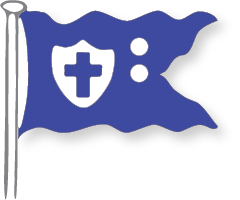 The Former Commodore flag is a square version of the Commodore flag. It is customary in foreign ports to fly a miniature version of the National Maritime Ensign as a courtesy flag at the starboard spreaders. Only one courtesy flag should normally be flown. Courtesy flags should only be flown above (superior to) any other flags on the same halyard. Local Flags should not be flown in lieu of courtesy flags but can be flown at the port spreader in addition to them. Within the British Isles, courtesy flags are not strictly necessary. 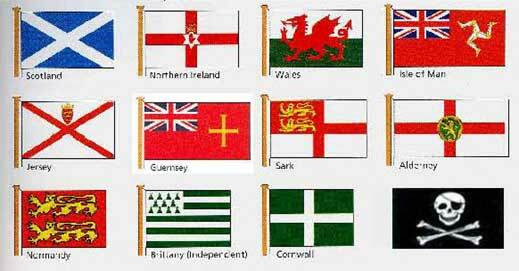 The flags of Scotland, Northern Ireland, Wales, Isle Of Man, Jersey, Guernsey, Alderney, Sark and Herm may however be flown at the starboard spreader, out of politeness. Some owners and organisations have private flags. These may be flown in harbour at the port spreader. Such flags should only be flown at the same time as Ensigns and Burgees. It is customary for yachts to salute both warships of all nations and flag officers of their own Club.